JetBlue flight 387 passengers hold up representations of Cuba's national flag, just before touching down at the airport in Santa Clara, Cuba. 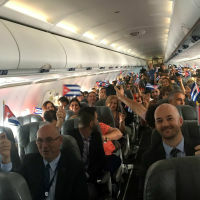 The first commercial flight between the United States and Cuba in more than a half century landed in the central city of Santa Clara on Wednesday. The flight of JetBlue 387 opens a new era of US-Cuba travel, re-establishing regular air service severed at the height of the Cold War. There will be around 300 flights a week connecting the US with the island, which was cut off from most Americans by the 55-year-old trade embargo on Cuba and formal ban on US citizens engaging in tourism on the island. Historians disagree on the exact date of the last commercial flight but it appears to have been after Cuba banned incoming flights during the October 1962 Cuban Missile Crisis. "Seeing the American airlines landing routinely around the island will drive a sense of openness, integration and normality," says Richard Feinberg, author of new book Open For Business: Building The New Cuban Economy. "That has a huge psychological impact," he says. The restart of commercial travel between the two countries is one of the most important steps in President Barack Obama's two-year-old policy of normalising relations with the island. Cuba's vice minister of transportation, Eduardo Rodriguez, said: "It's a positive step and a concrete contribution to the process of improving relations between the two countries." US travel to Cuba is on track to triple this year to more than 300,000 visitors in the wake of the 2014 declaration of detente. Cuba's cash-starved centrally planned economy has been bolstered by the boom in US visitors, along with hundreds of thousands of travellers from other nations hoping to see Cuba before more Americans arrive. Commercial flights are expected to greatly increase the number of American visitors. Many of the air routes are currently used by expensive charter flights that are largely expected to go out of business with the advent of regularly scheduled services from the US. Hundreds of thousands of Cuban-born Americans fly to the island each year with the chaotic, understaffed charter companies. These require four-hour check-in waits and charge high rates for any luggage in excess of restrictive baggage allowances. Cuban officials insist the continuing US ban on tourism will limit the impact of commercial flights to Cuba. Americans are allowed to visit the island on "people-to-people" cultural and educational visits, among other reasons. US citizens will be able to fly within weeks direct from cities including Chicago, Philadelphia and Minneapolis, Miami and Fort Lauderdale to eight Cuban cities and two beach resorts.